In light of the drastic funding cuts recently announced by the National Endowment for the Arts, it’s more important than ever to support such hard hit PBS series as Independent Lens, P.O.V. and American Masters. Independent Lens, produced by ITVS in San Francisco, for example, was socked with a massive $120,000 NEA funding cut for 2012. Without these national indie film showcases, we would lose our primary exposure to important documentaries and the talented filmmakers who often drain their bank accounts and sometimes risk their lives to produce films about hot button social issues, maverick trailblazers and exotic cultures. An upcoming Independent Lens broadcast premiere, well-timed for Memorial Day (on PBS, check local listings), is a case in point. Hell and Back Again was fortunate to receive a much-deserved Academy Award nomination this past year for Best Feature Documentary; but, if not for Independent Lens, the film would have had little hope for widespread distribution outside of the film festival circuit given its intense subject matter. Filmed and directed by Danfung Dennis, a seasoned photojournalist who has covered the wars in Iraq and Afghanistan since 2006, Hell and Back Again tracks the harrowing mission of U.S. Marines Echo Company, 2nd Battalion, 8th Marine Regiment, as they launch a major assault on a Taliban stronghold in southern Afghanistan. 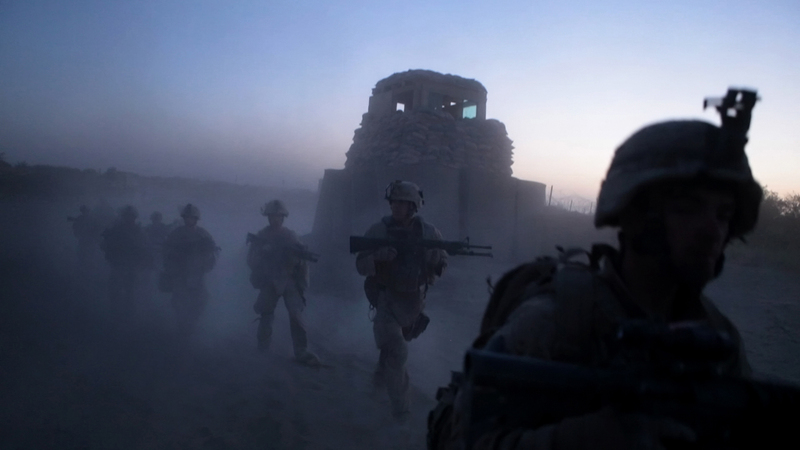 Within hours of being helicoptered behind enemy lines, Sergeant Nathan Harris and his unit must do whatever it takes to extend an olive branch to local Afghan elders who want nothing to do with the Marines and their professed good intentions. Building trust with these uprooted natives is clearly a futile endeavor as is the troops’ attempt to eradicate their shared elusive enemy, the Taliban. Dennis’s on-location, in-your-face footage pulls no punches. The language is raw and so are everyone’s nerves. The mission ultimately almost kills 25-year-old Sergeant Harris, whose recovery is followed back in the States as he undergoes physical therapy and mends his mangled leg with his supportive wife, Ashley, by his side. Dennis parallels Harris’s highly competent command on the front lines with his aimless days at home in North Carolina as he yearns to be healed and back in Afghanistan for yet another round of warfare. His transition is fraught with crippling anxiety attacks and physical pain. The cross-cutting between Harris, cool in command, with Harris, on-the-edge while on-the-mend, powerfully underscores the conflicted emotions that are never far from the surface in war and peace for this dedicated Marine. On the home front, Harris negotiates Wal-Mart, his marriage and his living room without ever losing sight of his gun collection, his pill bottles and his memories of fallen comrades. Hell and Back Again stands with the very best wartime documentaries as a potent reminder to celebrate the daily sacrifices of our troops and their families…whether we agree with their marching orders or not. This entry was posted in Film, TV and tagged Academy Award Nominee, Afghanistan, Danfung Dennis, Hell and Back Again, Independent Lens, National Endowment for the Arts, U.S. Marines, U.S. Military, War & Peace. Bookmark the permalink. This sounds great. Thanks for putting it on my radar, because I might have missed it otherwise. Thanks! As luck would have it, the film was originally scheduled for its broadcast premiere on Memorial Day, at 10:00 p.m., but I see it has been bumped in NY by Bill Moyers and reskedded for 2:30 a.m. on Tuesday, May 29. It’s always good to “check local listings” for PBS airdates, especially for independent cinema programming.